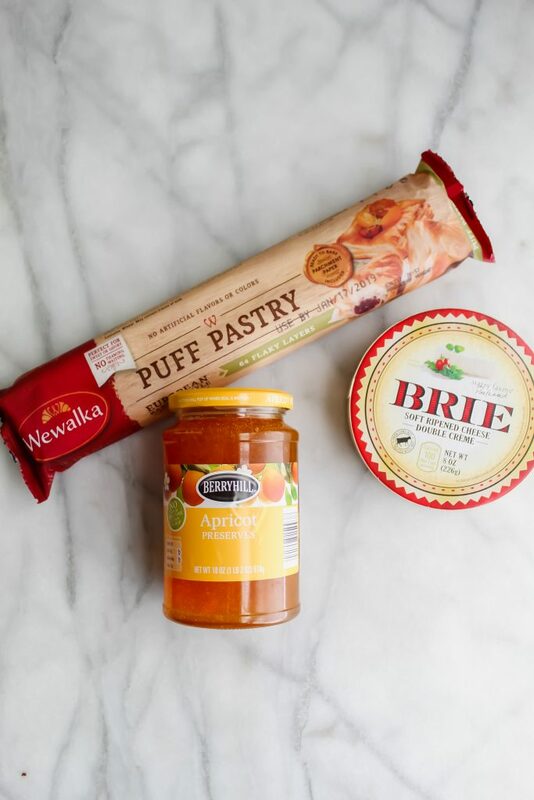 This Baked Brie with Apricot Preserves is truly the perfect appetizer for any party! Baked in buttery, flaky puff pastry, ooey gooey cheese covered in sweet apricot preserves, it’s melt in your mouth delicious! Say hello the best appetizer/dessert/delectable treat you will ever feast your eyes upon.. I was introduced to Baked Brie a couple of years back when my sister in law Megan brought it to Christmas Eve dinner. It was so delightfully different. I think I ended up eating most of it that night… So I knew that I wanted to attempt and make it for the blog. I’ve always loved cheese. However, I must admit, the cheese I ate was never the fancy kind. My childhood consisted of bringing a string cheese stick with me to lunch and peeling it. Anyone else not trust folks who bite straight into string cheese?! Team peel for life! Needless to say, I never even really knew what brie was until I was older. The only types of cheese that were in my life were as followed: cheddar, mozzarella, and velveeta – you know, that super processed but delicious cheese? Yup. I soon began to learn about brie, gruyere, pepper jack and enjoying all of the super sharp flavors of them all. It was like a whole new cheese universe. So, when I was deciding the treats I would be baking this holiday season, I KNEW this had to be on my list. As much as I love Christmas cookies, this dish serves as a nice break between the overly sweet treats. This dish has the perfect combination of sweet and savory. It also somehow completely nails the crispy, buttery and flaky outside and the melt in your mouth inside. It blends so many flavors and textures together, you may just explode with joy while eating it. This is such an insanely easy recipe. Even non-bakers like me can do it! First, you take the store bought puff pastry and place the brie in the middle, followed by several spoonfuls of the jam to cover the top of the cheese. Next, you simply fold over the puff pastry onto the cheese. It doesn’t have to be any intricate design – I just folded over one corner at a time. Lastly, beat an egg in a small bowl and brush it onto the pastry until it’s fully coated. Bake until it’s golden brown and delicious. You’ll feel like a freaking pastry chef. The caramelization on top of this beauty is TO DIE FOR. SERIOUSLY JUST LOOK AT IT!!! When you cut into it, it literally just melts out cheese and jam. It’s. so. rich. and. decadent. Also, you can add any type of preserves! I just prefer the apricot. If you wanted to make this dish extremely classy, I would recommend putting it on a cutting board and forming a cute little cheese board! Complete with crackers, jams, tapenades, fruit, extra cheese, etc. That would really wow your guests at your next party! Or you can just be like me – and eat it straight off the pan with a fork. No judgement here! Enjoy this, y’all. It’s one of my favorites. 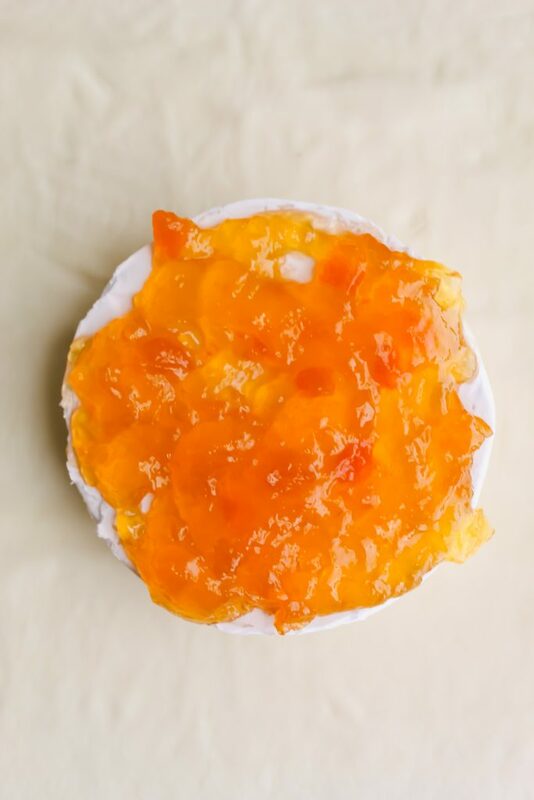 A sweet, savory dish that's filled with oooey gooey brie and sweet apricot preserves. 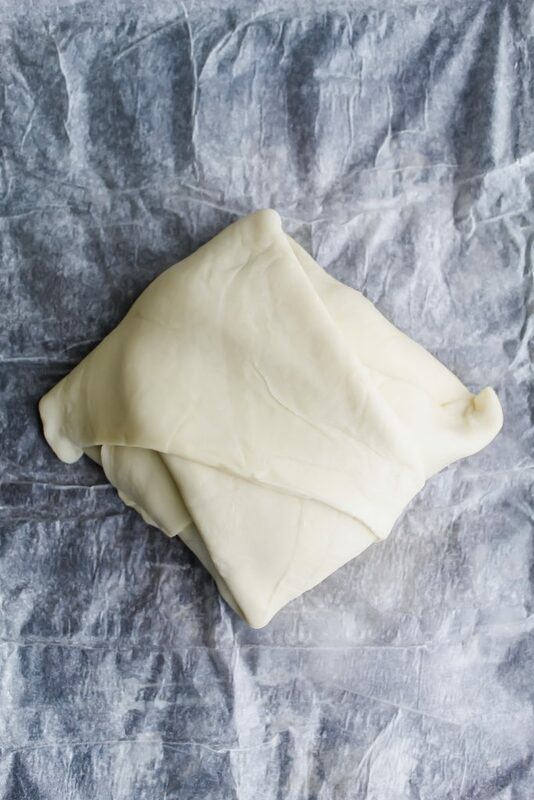 Roll out your sheet of thawed puff pastry. Spread out on counter top with flour under it in needed. Roll out the pastry until the edges are even, just enough to get the crinkles out at the ends. Place brie in the center of the pastry. Add 2-3 tbsps of apricot preserves to completely cover the top of brie. Wrap the brie up neatly - one side at a time. Beat one egg. Brush onto pastry until fully covered. Move onto lined baked sheet and bake for 35 minutes. Let it cool for 10 minutes. Serve hot with crackers, fruit, or just eat with a fork! Enjoy. All thanks to you, sweet Megan! What is in the bowls? This looks SO good Haylie! I’ve always loved cheese too. I remember waaaaaay back when in my high school yearbook and a question was ‘Favourite food’ and I wrote ‘anything with cheese’. And, then, in the podcast interview I did, I talked about it again. I guess I’m addicted, lol. Anywho – can’t wait to try this one over the holidays. How good with this be with a glass or two of vino?? Lol! Cheese is seriously the best, Dawn! 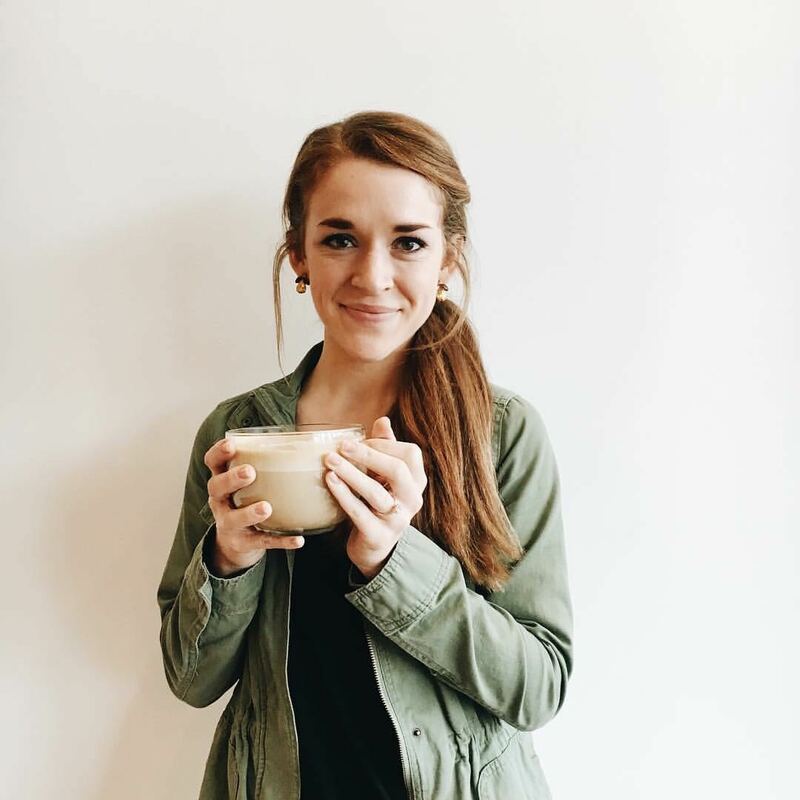 One time, my husband and I went vegan for a month and it may have been the saddest month of my life! I could probably do without the meat…but I missed cheese so much! And you’re right! This would be AMAZING with wine!! I’ve cut out a lot of dairy in my life, but cheese is one of the exceptions. And brie is one of my favourites. I love it baked in puff pastry or phyllo, or simply melted on toast. I usually pair it with berries, but I love that you paired it with apricot preserves. Totally perfect for a holiday appetizer! Cheese is always the exception for me as well, Leanne! Lol! I bet it would be amazing melted on toast!! Melty brie is so delicious.